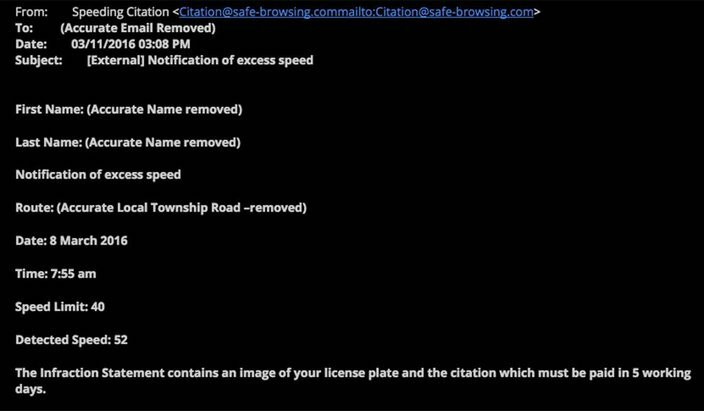 A malware scam that poses as a speeding ticket email is targeting drivers in Tredyffrin Township, Chester County. Tredyffrin police are warning drivers to ignore any emails claiming to contain a speeding ticket. Police do not issue such violations via email. The fake violations include accurate speed, time and location data that police suspect is gained from a compromised mobility or traffic phone app. The scam directs people to pay fines by clicking on a link or downloading an attachment form. Instead, malware is loaded onto the device. The scam uses emails being sent by the address citation@safe-browsing.com. Police in Tredyffrin, Chester County, posted this as one example of a scam letter sent to a township resident.